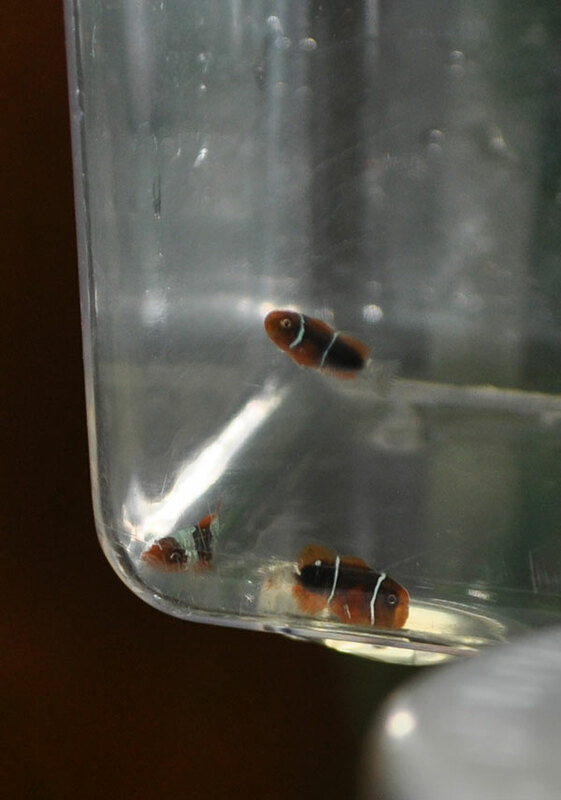 The Genetic Possibilities behind the “Lightning” trait in PNG White Stripe Maroon Clownfish, Premnas biaculeatus. A special thanks goes out to Shane & Len at Advanced Aquarist for co-publishing this blog entry there - it seemed like the perfect contribution given the style of material they like to cover. Just to bring you up to speed, it’s been over 2 years since the “Lightning Maroon” from PNG made it’s way to the US and ultimately into my home tank. It was a long time coming but in the late spring and early summer of 2012, we finally got a glimmer of success with the first and second spawning between the “Lightning” Maroon, and a normally patterned “wild-type” Maroon clownfish. The pairing below are the two parents responsible for everything we’re about to cover. 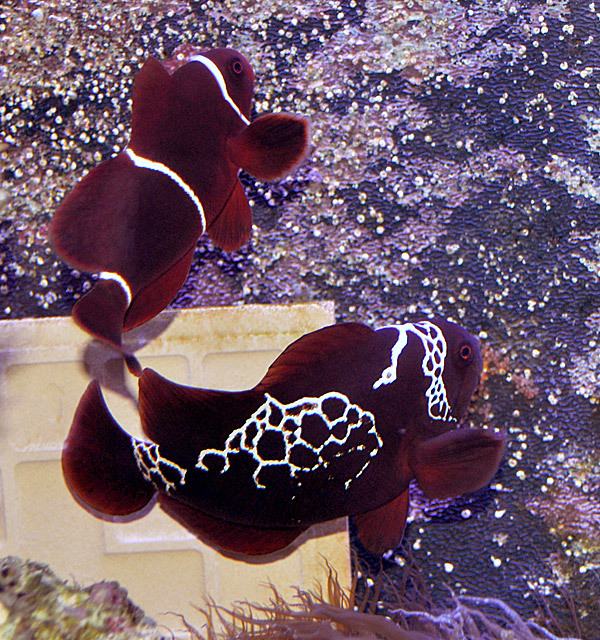 The Lightning Maroon Clownfish and her wild-type mate. So not only did we get a spawn that made it, but we got roughly 50 juveniles post-settlement in the very first rearing attempt. Now, more than 2 weeks in, it seems ever more likely that we have a roughly 50% rate of “Lightning” babies in our group of offspring – note I have yet to do an actual headcount, this is just a ballpark guesstimate on the numbers. Initially the babies showed up with blue “caps”; thicker headstripes that were readily discernible. As they progressed, they looked more and more like Picasso Percula babies. While still possibly premature to say conclusively we have “Lightnings”, we’re definitely starting to see signs that the Lightning trait will come through with defining characteristics that will clearly match up with those that the two original wild Lightning Maroons shared. Before going into the genetics discussion, I’m going to address one “possibility” that some creative thinkers might propose, either though just being “creative”, or through having read, misread, or misunderstood what someone has posted on some forum somewhere. The hypothesis is this; the Lightning Maroon is a different species than a normal white stripe maroon. And thus, are these offspring “hybrids”? Categorically I firmly believe no, the Lightning Maroon does not in any way represent a species other than Premnas biaculeatus. In most hybrid scenarios between two species, the initial primary hybridization generally yields a predictable intermediate form between the two parental species – I am sure there are examples of a primary hybrid where the offspring “range” from one parent to the other, but that is far more common in the second generation if it’s going to happen. Since we have no intermediate forms in the offspring of this pairing, I believe we can safely rule out the “hybrid” hypothesis without further delay (the same cannot necessarily be said if we look at the “White Stripe” vs. “Gold Stripe” Maroon…the more I read and learn and see…leads me to believe these may in fact be two distinct species in the wild). I’ll state up front that I’m no geneticist, and that I’ve been known to get my terms confused. So I’ve taken the opportunity to run this by Adeljean Ho (a good friend of Dr. Matthew L. Wittenrich, and the scientist who published work in CORAL that suggests a unique genetic basis for the “Red” form of the Green Mandarin). Hopefully he caught any errors I may have made in attempting to distill and disseminate these ideas. Remember, I really downplay the “designer” aspects breeding of marine fish with mutations, but taking on the preservation of this wild trait has forced me to learn it. 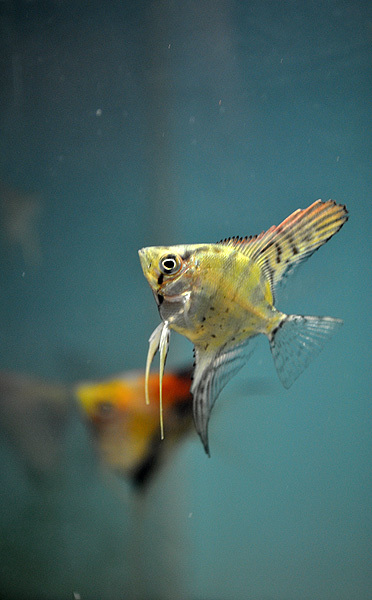 Understanding the genetics allows a breeder who is working with “designer” fish to quite literally “create” what he or she envisions; the upshot of this knowledge is that it also levels the playing field for breeders, forcing them to turn back to producing QUALITY fish in order to differentiate themselves. For me, the emphasis on quality, as driven by “open sourcing” the genetics of a fish, is the best route we can go if we must pursue “designer” variants going forward. In this discussion of possible Lightning Maroon genetics, here are the important terms. We will try not use the term “gene”, because it kind of gets used interchangeably and thus will probably only confuse. The important terms here are “locus” and “allele”. “Locus” being a specific point in the genetic code where a particular pairing of alleles resides; the alleles being the pieces of genetic information, one from the father, and one from the mother, that come together at the locus to form the genetic makeup of the offspring. We also cannot neglect the terms genotype and phenotype. Genotype refers to the genetic “code” specifically, which is important because alleles can be present yet not “expressed” in the phenotype. Yes, the phenotype is the outward appearance as driven by the genetics. And this is the conundrum; due to the way certain alleles interact with other alleles, there are traits that can be masked, surpressed, or unexpressed, that is to say you won’t know a fish carries a hidden albino gene in its genotype just by looking at it (and seeing it’s phenotype). The other important terms to remember are “homozygous” and “heterozygous”; all that really means is whether the two alleles in the loci pair are the SAME genetic code (homozygous, such as A/A or B/B), or different (heterozygous, often abbreviated as “het” for short, such as A/B). Considering the entirety of our genetic makeup, it all boils down to loci (plural of locus) and what pairing of “alleles” is inherited at each locus. Obviously, the outward result of these traits is the result of all these separate loci together, and certainly some observable traits may be governed by multiple loci, which makes it difficult to ascertain the genetics and inheritance behind them. By the same token, the possible individual alleles that can be present at a loci are perhaps infantasimal in their variation (for example, ABCDEFGHIJKLMNOPQRUSTUVWXYZ), but only two individual alleles (eg. A/Z, C/C, or B/Q) will be present in any particular locus. That said, most all of the genetic variations that we’ve come to openly understand in fish seem to be the result of the genetic makeup of an individual loci, and from there, the combination of multiple traits at different loci is what gives us a well-understood, massive diversity of ornamental fish varieties (as some would call them, “Designer” fish). 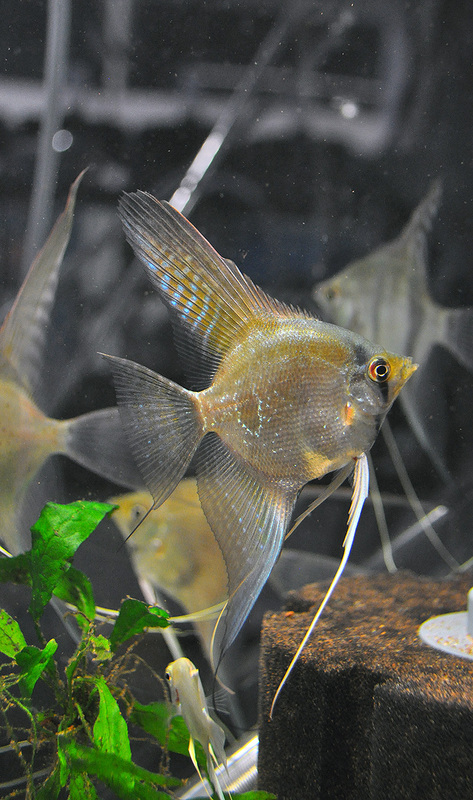 Freshwater Angelfish (Pterophyllum scarlare) make the perfect example as they are well understood genetically (see The Angelfish Society’s Phenotype Library). 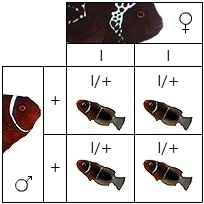 Combining multiple traits from individual loci is how we get a Pearlscale Lace Clown Veil Angelfish. Those names refer to phenotypes; outwardly discernible traits, in this case those names refer to scale structure + dark gene + stripe genetics + fin length. In the Angelfish breeding community, this would get denoted roughly as (p/p) – (D/+) – (Z/S) – (V/+). Because we know which alleles at which loci contribute to each end result, in theory any breeder can “make” a Pearlscale Lace Clown Veil Angelfish; the breeder just needs to have the proper parents with the proper genotypes. 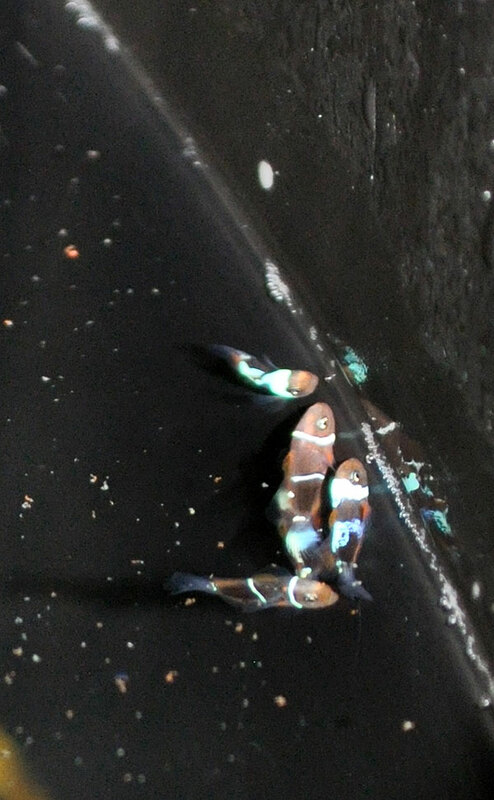 The breeder also knows that mating two Pearlscale Lace Clown Veil Angelfish together will result in a plethora of unique genetic combinations, 27 to be exact, all of which have their own name. One example? Pearlscale Blushing Superveil Angelfish, (p/p) – (+/+) – (S/S) – (V/V). I’ll borrow notation from the freshwater Angelfish world to try to lay out the options for the Lightning Maroons, and I’ll propose that “L” will stand for the Lighting allele. “+” will stand for the wild-type, default state allele (aka. a normally striped fish). Thus, a wild fish, without any “Lightning” genetics, would be represented as (+/+). Note that in this notation, capital letters are normally used for dominant or partially dominant traits, whereas recessive traits are generally denoted using lowercase letters. I’m going to assume right up front that “Lightning” is a trait that directly controls the “striping” of the fish. We are going to assume here that there are only two possible alleles involved in what we are seeing, and that the Lightning Phenotype is driven by one specific allele (L in our examples) and is not in fact the result of two unique alleles coming together (eg. Lightning = L/X, wild fish being +/+). We are also going to assume that the Lightning trait is the result of genetics at one locus only. A brazen assumption, but it seems likely at the moment. To explain the multiple locus issue another way, we are assuming it does not take the genetics of two (or more) loci to result in the Lightning phenotype. 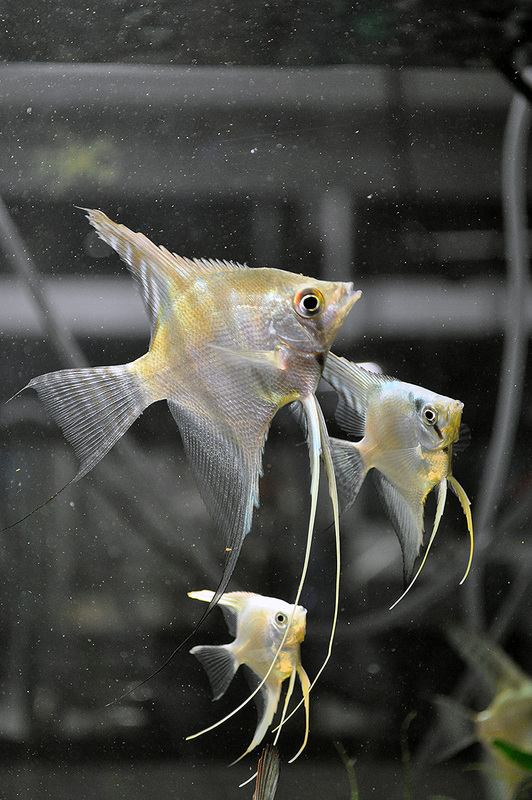 In the Angelfish world, there are phenotypes like Platinum that are the resultant combination of two independent loci, and the presence of specific recessive alleles in homozygous pairings, that result in the all white Platinum Angelfish – in this case the recessive gold trait on the “dark” locus, and the recessive Philippine blue trait on the “philippine blue” locus. Independently, you’d have a Gold Angelfish, or a Philippine Blue Angelfish, but “activate” both of those recessive traits through breeding choices, and you wind up with the possibility of all white platinum offspring. Yes, you can “make” a Platinum out of parents that are not outwardly “Platinums” themselves, and that is the beauty of understanding the genetics. What you cannot do is use only Platinums to breed back to the wild form of an angelfish – and that is the curse of “designer” breeding (which is one reason why designer-focused breeding can get in the way of conservation minded breeding – the “ornamental” genetics can function as actual genetic contaminants…but that’s for another day). Genetics in action - the large fish in the foreground is a wild Angelfish, generally presumed (+/+) unless it carries hidden recessive alleles, and called a "Silver", which is the default striping pattern in Pterophyllum scarlare. The Blue one at right is a "Blue Ghost", representing 2 doses of the Philippine Blue allele, and a single dose of the partialy dominant stripeless allele, so (pb/pb) - (S/+). The white angelfish in the back is a "Platinum", the result of a fish being both homozygous for the recessive Philippine Blue allele, as well as homozygous for the recessive Gold allele, thus (pb/pb) - (g/g). Based on the quantity of Lightning Maroons in the very first batch of offspring, there are three possibilities for how the Lightning Maroon trait genetically functions. It could be a recessive trait, whereby there must be two alleles for Lightning present in order for the Lightning pattern to be observed. Lightning could in fact be a dominant trait, whereby it only takes a single dose of the Lightning allele to mask the normal stripping pattern. And the Lightning trait could be the result of a partial (incomplete) or even codominant allele, where a double dose fish will look different than a single-dose fish, which is still different from the wild type, normally-barred fish. So let’s look at inheritance and expression of the genetics in play. We’ll start with the easiest to understand, a recessive trait like albinism (I think we all understand how albinism works on some basic level). 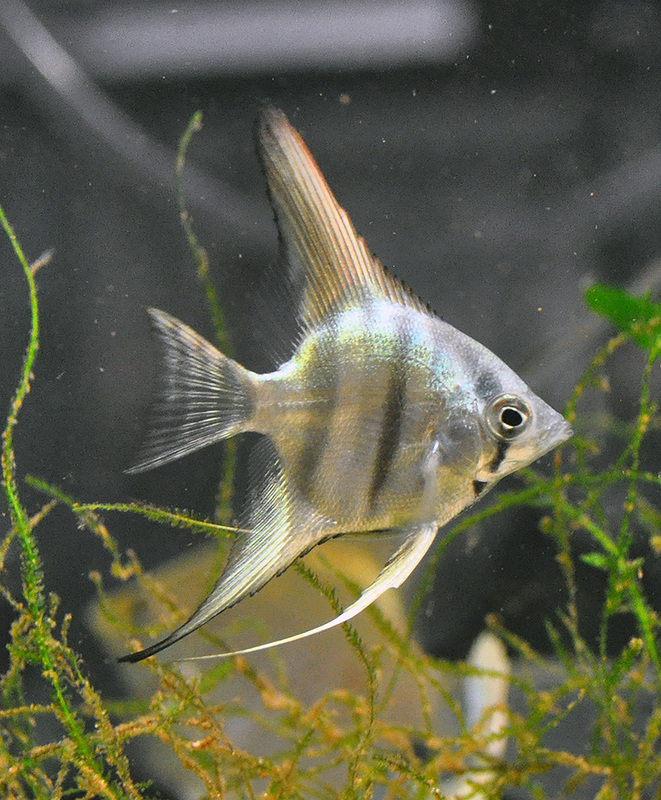 Another good example – the recently discovered Philippine Blue gene in Angelfish is thought to be recessive. A fish with a single dose of this allele (pb/+) shows no real difference with the wild form. But put on a second dose, and *Bam*, you have a Philippine Blue Angelfish. A Blue Silver Angelfish , (pb/pb). 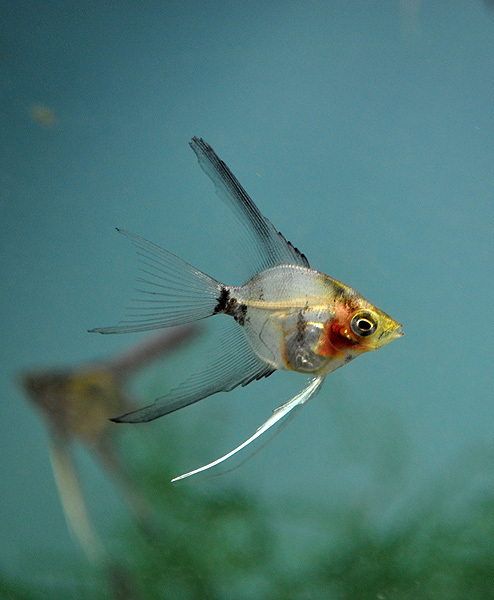 The angelfish breeding community is thoroughly convinced that pb is a recessive trait on its own locus. 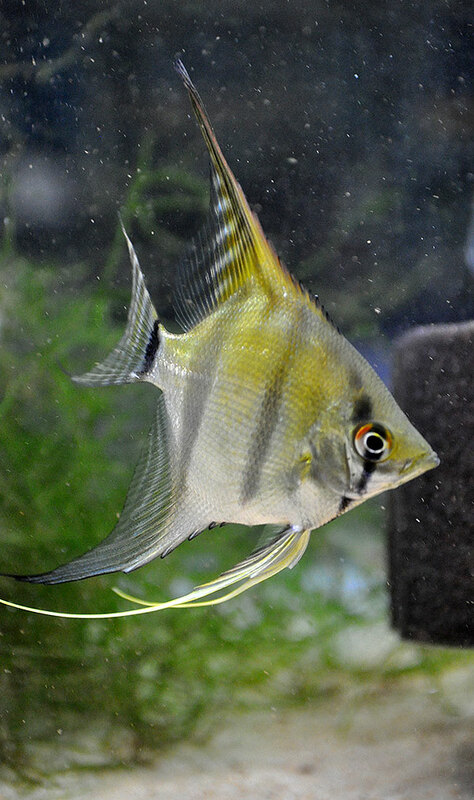 This angelfish is a "Silver", and happens to be a sibling to the Blue Silver angelfish shown above. There is a 2/3 chance that this fish has a hidden Philippine Blue allele, denoted as (pb/+), otherwise it is wild-type in every known sense, written as (+/+). If these two fish were mated, and none of the offspring developed into blues, that would prove the 1/3 chance of this fish having no hidden blue allele. If “Lightning” is a recessive trait (one that requires two “doses” of the Lightning allele), then the Lightning parent could only be homozygous (l/l). A fish that is heterozygous (l/+) would appear “normal”. Thus, if our (l/l) fish is mated to a wild type (normally barred) fish with no Lightning genetics (+/+), all the offspring would be (l/+). Such a pairing would result in 0% discernible Lightning Maroons, as all offspring are (l/+) (Figure 1). Figure 1. Recessive Lightning to Wild homozygous Mate = all hets = no Lightnings. Thus, if “Lighting” is recessive, we know that the Lightning Maroon must be (l/l). If recessive, to have found Lightning offspring in the first generation mating, that implies that the standard-barred mate must carry a “hidden” Lightning allele, and thus be (l/+) itself. Mating (l/l) to (l/+) would give you a 50% expression rate IF (and that’s a big if) the Lightning trait is recessive. Mathematically, the door is open for this trait to be recessive (Figure 2). Figure 2. Recessive Lightning to Wild heterozygous Mate = 50% Lightnings. Now, there is an upside if this trait is recessive; it means we got lucky. Primarily, it means I got lucky on the selection of the non-Lightning mate, because there would be no way of knowing it carried a single-dose, non-expressed Lightning gene. It would mean that the game plan of using a mate from the same island paid off. If you find a wild albino fish, you are most likely to find more albinos in the same geographic region because they’d probably be siblings. Not to mention that many of the non-albino siblings in the area could potentially carry a single albino gene as well. The other way we will be lucky is that IF Lightning is recessive, and if the initial percentage is in fact roughly 50%, it would mean that all the siblings would then have to carry a single, non-expressed Lightning allele (because their only option from the Lightning parent is to receive a Lightning allele). This would mean that every fish in the group if mated would produce 25%, 50%, or 100% Lightning Maroons. To put it in a commercial context; if we definitively knew that this was a recessive trait, then even the normally striped offspring would be tremendously valuable to breeders, because simply mating two of those together yeilds 25% Lightning. In an interesting twist, it seems most people expected the Lighting trait to be recessive if genetic, and assumed that we would get the results shown in Figure 1, and only in the 2nd generation would we get more Lightnings, as shown below (Figure 3). Figure 3.Hypothetically recessive heterozygous F1 Offspring, mated together, produce 25% Lightnings. Still, I’d love to hope that this trait is recessive because it means all the siblings would then carry a hidden Lightning allele. In looking at the number of wild Lightning Maroons presumably observed (and thus caught), we know of only 2. This rarity could suggest a recessive trait, as two wild fish with hidden Lighting Genes, mating together, would produce 25% Lightnings. Given that a clownfish pair’s minimal reproductive goal is to produce two replacements, you can quickly see how a single pair of clowns, constantly churning out babies that are 25% “Lightnings”, might only yield a handful at best (remember, marine fish have been shown to suffer massive mortality in the earliest hours and days of their lives – most never even make it to settlement, and most of those, not past their first year). Lightning Maroon babies truly stand out in the rearing tank while their normally patterned siblings are difficult to see; you can’t help but assume Lightning offspring be much easier for predators to locate. So the rare Lightning making it in the wild would fit well with a recessive trait hypothesis. But what are the odds that I got “lucky” with the mate I selected? Impossible to say, but Occam ’s Razor suggests that the following scenarios could be more likely. Let’s deal with straight up dominance. If this is a dominant trait, then you only need one “dose of the gene” to express the trait. To simplify, breeders tend to view dominant traits as being pretty uniform in their expression, and there’s no difference whether you have one dose or two. In other words, a Lightning Maroon Clownfish could either be (L/L) or (L/+) and would look the same. A good example of this, to borrow from the Angelfish community, is a trait called “Zebra”, which adds extra bars and patterning in the fins. There’s no visible difference between a homozygous Zebra (Z/Z) or a heterozygous Zebra (Z/+). A young Zebra Angelfish, straight up dominance means this fish could be (Z/+) or (Z/Z) - the only way to know is through planned and controlled matings and observing the results. Let’s again weigh the options. If Lightning is dominant, then the non-lightning mate can only be (+/+). Why? Because any fish that is (L/+) is going to be Lightning. So in this scenario, the normal mate can only be (+/+). That leaves the Lightning Maroon to be either (L/+), or (L/L). Now, here’s where it gets interesting. If the Lightning Maroon was (L/L), we would have 100% Lightning Maroons in the offspring, because every fish could only get a ( L ) allele from the Lighting Maroon, and all (L/+) offspring would then be Lightning (Figure 4). Since we don’t have 100% Lightnings in the offspring, we can rule out the Lightning Maroon being (L/L) if this is a dominant trait. That would leave (L/+) as our only genetic option for the Lightning Maroon, which would thus result in a roughly 50% expression rate in the F1 generation. The inheritance of the ( L ) allele from the Lightning parent is a just a coin toss, 50% of the time they get a +, and 50% a L. Once again, the rules of genetic expression and inheritance suggest that this is a possible genetic explanation given the initial results we’re seeing (Figure 5). Now, my problem with this trait being dominant starts immediately from the fact that it requires at least one outwardly visible Lightning Maroon Clownfish to be breeding in the wild in the first place (unless there is a wild-type pair that is predisposed to throwing off the odd “Lightning” mutation once in a blue moon – afterall, these traits can appear spontaneously). If this trait is dominant, then it might also suggest that this mutation ought not to be as rare as we currently are led to believe it is. And to make matters worse, it does seem that we haven’t seen much straight up “dominant” variations in ANY of our designer clownfish to date; it seems all are either recessive or the result various doses of partially dominant traits. And surprise again; looking back at the Angelfish (which happen to Cichlids, which are a closely related family to the Damselfish, and thus to the Clownfish), we see this: 0nly 1 truly straight-up dominant trait. Meanwhile, there are currently 5 known recessive traits, and 7 traits that are either partially dominant or codominant. Dominant traits just don’t seem that common in clownfishes. What if “Lightning” represents Partial Dominance? So what if this is a partially dominant (aka. incomplete dominant) or co-dominant trait. The difference is nuanced, but in the angelfish world co-dominance can cause “blending” of traits in certain mixes, dominant expression in other mixes, whereas partially dominant traits present more of an A/B/C result. To draw a parallel, some might say that if the Lightning trait were codominant, then a fish with a single Lightning allele should still show the white stripes “underneath” the lacy pattern of the Lightning. I’ll dispense with codominance for the time being and just refer to this option as the partial dominance possibility. Partial (incomplete) dominance is perhaps the most plausible and most exciting of the three options. As the scenarios are about to play out, they suggest that the Lightning, in a partial dominance scenario, would only be the “first step”. Partial dominance is well documented in angelfish, and the stripeless allele is a great example. A normally striped angelfish is Silver (+/+), a single dose is a Ghost (S/+), and a double dose is a Blushing (S/S). Take a look at a Ghost and compare it to a Blushing that happens to be showing a second partially dominant trait, the “veil” fin trait (impossible to say at this young size whether our example fish is simply veil (V/+) or super veil (V/V)). A single dose stripeless angelfish, (S/+), aka. a "Ghost". You can see a "Silver" (wild type, standard barred, aka. (+/+)) Angelfish in the background at right for comparison. A Blushing Angelfish with two doses of the "Stripeless" allele, (S/S). If “Lightning” is a partially dominant trait, the results in the offspring push us to only one genetic possibility. Let me step back to explain why. There are currently only 2 forms of observable pattern in the offspring; “Lightnings” and “normal”. Simply put, the Lightning cannot be (L/L) in the partial dominance scenario. 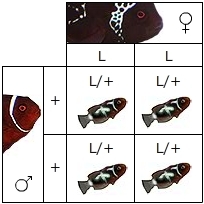 If a partially dominant allele is present in a homozygous state (L/L) and mated to a wild type fish (+/+), we should get all (L/+) – something intermediate between the Lightning and the Wild form, and they should all be the same (emphasis again on the fact that there would be no Lightnings, and no normally barred fish either) (Figure 6). We don’t have that result, so (L/L) is ruled out if Lightning is a partially dominant trait. Or is it? The second consideration for parental genetics would be (L/L) x (L/+), but once again here, the (L/+) cannot look like the wild form, as (L/+) represents an “intermediate form”. Someone out there is going to say “but what if (L/+) does in fact look like the wild form? If it did, then by definition Lightning would be a recessive trait as I described earlier (Figure 2)! So this scenario is ruled out. The third consideration would be (L/+) x (L/+), but then again that would mean both mates should be “intermediary” forms and roughly look the same (which they obviously don’t in our pairing). This alone is enough to scrap this mating as a possibility. But if you’re not convinced, this hypothetical mating would also mean that 25% of the offspring would be (L/L), 50% (L/+), and 25% (+/+) – if the fact that the parents would have to look the same didn’t throw this out for you, consider that there would still have to be THREE (3) phenotypes in this batch of offspring for that proposed genetic combination in the parents to make any sense (which it can’t, because the parents are not the same). The only way that “Lightning” works as a partially dominant trait is if the Lightning Maroon is (L/+), and the mate is (+/+). This produces a nice occurrence of 50% like the Lightning, 50% like the male parent (Figure 7). This also takes a lot of the “luck” out of the equation; we didn’t have to stumble upon a mate with a hidden allele like we would have in the recessive scenario. But getting back to the Lightning; if this trait is “partially dominant”, then the most exciting part is yet to come, because it would mean that all the fish we’ve seen so far only have ONE dose of the Lightning allele (L/+), and thus, the designer breeders out there will be clamoring to mate two Lightnings together so they can discover what a (L/L) fish is going to look like. And that’s the crazy part, because there should only be one of two things that could when we mate Lightnings together – either we’ll get 25% being something new, or we’ll just get more Lightnings. If we get 100% Lightnings, we are either looking at a recessive trait or a straight up dominant trait (or, in a less likely case the difference between a partially dominant (L/+) and (L/L) is simply too minimal to discern, and you’d then just treat it as dominant anyways). I suppose at this point we have to step back and objectively define what we *think* a Lightning Maroon “is”. What is the phenotype? We have to consider the two fish that have been given that label to-date (the less familiar one being the first wild-collected Lightning Maroon from 2008). Well, the best term I’ve heard used lately was to describe the Lightning Maroons as filigreed. Other’s commonly call the patterning “lacey” or “net-like”. Whatever it is, the most notable place for this Lightning variation is in the headstripe. The headstripe is dramatically wider in the Lightnings, and it is “pitted” with normal coloration. “Horned” and “Flaked” maroons fundamentally lack this very distinct patterning and the wider headstripe it takes to make it. The other part of the Lightning phenotype is the breaking up of the mid-stripe and tail-stripe into the lacey, interconnecting patterns that split apart and at times, reconnect. None of the “horned” maroons show this patterning that I’ve seen, while many “horned” maroons simply exhibit broken bars or “extensions” trailing off. Admittedly, only the most recent “Lighting Precursor” was really suggestive of the body stripping seen in the two wild Lightning Maroons, but the stripes showed a more “smooth” outline and did not reconnect (I’ve been told the other side of this fish was unimpressive) – I think this fish is better considered a more extreme form of these “Horned” Maroons being found in PNG waters. In drafting this genetics rundown, I realized I had one other genetic possibility on the table; the notion of the “Horned” Maroons being collected in PNG potentially represented the “intermediate” form in a partial dominance scenario (eg. the hypothetical heterozygous offspring shown in Figure 6). One such Maroon recently made the rounds in the internet being called by some a “Lightning Precursor”. After examining the data provided publicly by EcoAquarims PNG, it seems these aberrant Maroon clowns appear to be quite common in the waters of PNG, with various atypical Maroon clownfish being caught approximately every 11 days. We also had other fish like Mike Hoang’s Goldflake Maroons which indeed, as young fish, had me wondering if we’d see Lightning-like traits as they grew up (sadly the best marked offspring were lost, and those that remain look no different than the “Goldflake” Maroons output by Sustainable Aquatics). Let’s deal with the “Goldflakes” of the world first. It turns out that abnormally spotted and overbarred Maroon Clownfish (what I’m calling “Flaked” here) are indeed commonplace in captive culture. So far, these fish have seemed to elude genetic categorization, apparently really behaving fundamentally more like “misbarring” in other species of clownfish. Most recently German breeder Sylvio Heydenreich shared some videos depicting some highly overbarred Maroons on the MBI website; when asked about these fish, he stated quite directly that, “Die Fehlzeichnungen lassen sich ganz leicht über die Wasser Qualität steuern.” Or as Google likes to translate it, “The failure drawings can be controlled easily through the water quality.” Failure drawings of course, being what is probably a literal translation for “misbarring”. And to that end, we already are aware that misbarring in clownfish has environmental causes, not genetic causes. So as much as we like these “Goldflakes”, all observations to date suggest we think of this type of patterning as a likely non-genetic occurance. Meanwhile, those “Horned” Maroons coming out of PNG had all of us, even me, convinced that the Lightning Maroon could be a homozygous (double-dose) example for a partially dominant trait. Simply put, the breeding results don’t really suggest this possibility because we lack the intermediaries (I would’ve expected the 100% “horned” batch to show up, like Figure 6). Still, I do have two normally barred fish that show spots. Note the extra spot on the back of this normally barred juvenile. Is this baby a “Horned” Maroon? Well, here’s the kicker. There are only two ways you get hypothetical intermediates (intermediates being the proposed placement of the “horned” Maroons). You either get 100% in the F1 batch, or the male parent has to be an intermediate itself, in this case, a “Horned” Maroon. And this is where there’s still an outside chance – the male has a single broken tailbar. But…if this was in fact an “intermediate”, what genetics must we get in the offspring? 75% Lightnings, and 25% intermediates – NO wild-types. Again, let me be explicitly clear – for “Horned” Maroons to be “Lightning intermediates” or “Lightningprecursors”, I would have had to encounter “Horned” Maroons in the offspring and at a rate of 25% -or- 100%. So…if the babies all wind up showing extra horned bars and spots as they grow up over the next few months, and the ratio of Lightnings to non-lightnings is 3:1, there could still be “hope”. Otherwise, we have probably closed the book on the “Lightning Precursor” hypothesis that tried to link the Horned Maroons to the Lightning, at least for now. All of that said, what I really think we’re seeing here is something much more fundamental in the Horned Maroons. We are seeing this “flake” overbarring, a commonplace occurring in captive-bred maroons, showing up on a few random offspring. You wouldn’t notice it in the Lightning offspring because it’s just “painted over”, but you can see it in the normally barred fish. Years ago, breeders would have destroyed these types of fish as “culls”…that’s when the 3-bar wild-type fish was considered something to aspire to as a breeder, and not “common” and “boring” as many hobbyists may consider a wild-type clownfish today. Given that we know of a possible causal relationship between “overbarring” and “environment”, perhaps there is something environmentally going on in the waters of PNG to show us more “environmentally overbarred”, aka. “Horned” Maroons, than perhaps we might expect in other parts of the ocean. Or, and this is still a possibility; the “Horned” Maroons of PNG could yet represent another, distinct genetic variation. It’s certainly possible – breeding them could give us the answers, although it may be difficult in the face of commonly-occurring “flaked overbarring” potentially giving you a fish with the same basic phenotype. Let’s get back to the Lightnings. If we give equal weight to all three possibilities for the interaction of the “Lightning” allele, we are left with three scenarios for the genetics of the parents. Once again, notation here…(female first) X (male second). By this alone, each has a 1/3 chance of being right. There is a 2/3 chance, or 67% roughly, that the Lightning is (L/+). 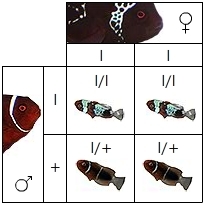 However, for the sake of doing something interesting, what if I used the genetic ‘spread’ in Angelfish to derive an alternate baseline for the odds of a trait being dominant, recessive, or partial/codominant within the clownfish family? 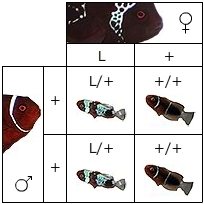 If this was at all representative of the odds for trait expression in clownfish (and it’s really probably not, it’s just a fun way to think about it), then we have a 62% chance that the Lightning Maroon is (L/+), and within that 62%, it would then represent a 87% chance that the trait would be partially dominant (again, roughly 54% overall). Overall, whether we weight the system or not, the odds remain in the rough territory of 2:1 that the Lightning Maroon is (L/+), and the mate I used is (+/+), vs the only possible alternatives of (l/l) and (l/+). The kicker for me is when you move beyond “probability” alone, and put in the observations and the way mother nature seems to work. I’ll get to my prognostication in a minute, but first, I must point out that this puzzle can be solved. How are breeders going to help figure it out? In a nutshell, this project will soon turn to the massive “cloud computing”, or in this case “crowd breeding” effort of marine aquarists who get these offspring. It has always been my intention to get the F1 fish out to other breeders to both diversify the risk, but also to leverage the collective efforts of breeders to provide for rapid, definitive answers. In a nutshell, anyone breeding with my offspring, you have my formal request to track your project at the MBI, and to do so openly. You also have my request that you must track your offspring numbers and take photos of each one on both sides, because it is the headcounts and photos that will help determine the genetics in the end. Here’s how we’ll do it (again, assuming that “Lightning” is the result of a single locus and a single allele). We can determine (or rule out) a recessive trait by mating the non-lightning siblings together; if recessive, 2/3 of the F1 babies will carry a hidden Lightning gene. 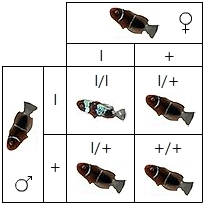 This means that picking any random 2 fish, the odds are roughly 40% that both are (L/+), so four out of 10 random pairings would yield Lightning offspring to the tune of 25%, if this is a recessive trait. The only way you get Lightnings out of pairing 2 normally-barred siblings is if this trait is recessive. We can also determine this trait to be recessive by matings of Lightning Maroons to their non-lightning siblings. 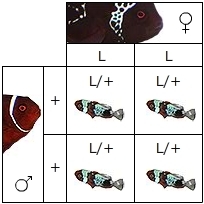 In this scenario, 2/3 of the pairings would produce 50% Lightning offspring, while the remaining 1/3 would produce nothing but normally striped fish. We don’t need to use the siblings to specifically test for a recessive trait, but non-sibling fish present a conundrum – you have less insights onto what their genetics could possibly be. Still, you can simply mate Lightings to unrelated white stripe maroons (and breeders out there, I will work as hard as I can to produce offspring from the other PNG White Stripe pair in the house so we have a clean PNG bloodline which we can outcross to, and Dale Prichard in the UK hopefully can contribute more, or you can look to the other PNG maroons being exported from EcoAquariums PNG now). If the trait is recessive, then you have to consider the unknown odds that any randomly-selected, unrelated fish, could be carrying a single hidden copy of the recessive allele. However, if the trait is partially dominant, any Lightning paired with a wild-type sibling, or any outcross (mating of a Lightning to unrelated normal fish) should yield a percentage (50%) of Lightnings in the offspring. Conversely, again, if the trait is recessive, these outcrossed matings will produce nothing but normally barred fish UNLESS, once again, you get “lucky” to stumble upon a fish with a hidden allele. But that’s the rub – you’re far more likely to find that hidden gene in the normally barred siblings. If we get something “new” out of the Lightning X Lightning mating, it should be 25% of the “new” variety, and that would convincingly clinch the genetics as partial dominance. Sounds far-fetched? Well, in Percula, Picasso X Picasso is where we get Platinums from. If mating Lightning X Lightning simply makes 100% Lightnings, then the trait easily falls into the category of a straight up dominant trait. …partial dominance. 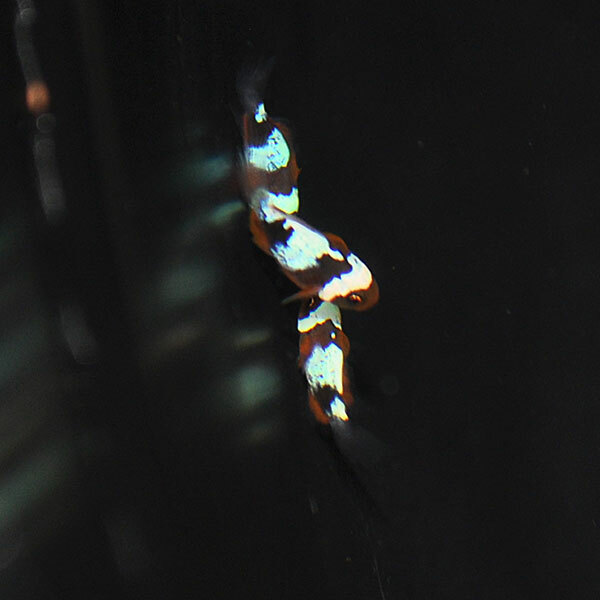 Ultimately, my gut call is for partial dominance because it seems to be the most commonplace type of genetic trait we’ve seen in our designer clownfish, and it’s the most prevalent in a widely cultivated and well-documented group of related fish (the freshwater Angelfish). The odds also do slightly favor partial dominance. Partial dominance may also be one of the easiest to prove – just mate two Lightnings together and see what you get. Partial dominance (and in this case, straight dominance) also requires less luck to have had the outcome I seem to have had with my initial pairing. If ever there was a project that had just about everything except “luck” on its side, it is The Lightning Project. One last wonderful caveat – every possibility laid out above could wind up being 100% wrong. Until we get those second generation fish produced, and aquarist start gathering the data and sharing it, we simply won’t know. A special thanks to Adeljean Ho for acting as a sounding board and editor on this piece. I am sure Adeljean, with his strong interest in genetics, was probably as excited about this as I am! Thanks!